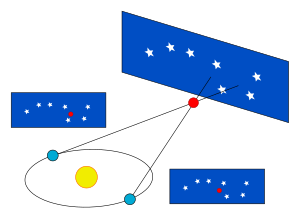 The parallax method is the fundamental calibration step for distance determination in astrophysics; however, the accuracy of ground-based telescope measurements of parallax angle is limited to about 0.01 arcseconds, and thus to stars no more than 100 pc distant. This is because the Earth's atmosphere limits the sharpness of a star's image. Space-based telescopes are not limited by this effect and can accurately measure distances to objects beyond the limit of ground-based observations. Between 1989 and 1993, the Hipparcos satellite, launched by the European Space Agency (ESA), measured parallaxes for about 7005100000000000000♠100000 stars with an astrometric precision of about 0.97 milliarcseconds, and obtained accurate measurements for stellar distances of stars up to 1000 pc away. ESA's Gaia satellite, which launched on 19 December 2013, is intended to measure one billion stellar distances to within 20 microarcseconds, producing errors of 10% in measurements as far as the Galactic Centre, about 8000 pc away in the constellation of Sagittarius. The most distant space probe, Voyager 1, was 6996703000000000000♠0.000703 parsecs from Earth as of January 2019[update]. Voyager 1 took 41 years to cover that distance. Galactic distances are sometimes given in units of Mpc/h (as in "50/h Mpc", also written "50 Mpc h−1"). h is a parameter in the range 0.5 < h < 0.75 reflecting the uncertainty in the value of the Hubble constant H for the rate of expansion of the universe: h = H/100 km/s/Mpc. The Hubble constant becomes relevant when converting an observed redshift z into a distance d using the formula d ≈ c/H × z. The nearest large galaxy cluster, the Virgo Cluster, is about 16.5 Mpc (54 million light-years) from the Earth. The particle horizon (the boundary of the observable universe) has a radius of about 14.0 Gpc (46 billion light-years). To determine the number of stars in the Milky Way, volumes in cubic kiloparsecs[b] (kpc3) are selected in various directions. All the stars in these volumes are counted and the total number of stars statistically determined. The number of globular clusters, dust clouds, and interstellar gas is determined in a similar fashion. To determine the number of galaxies in superclusters, volumes in cubic megaparsecs[b] (Mpc3) are selected. All the galaxies in these volumes are classified and tallied. The total number of galaxies can then be determined statistically. The huge Boötes void is measured in cubic megaparsecs. In physical cosmology, volumes of cubic gigaparsecs[b] (Gpc3) are selected to determine the distribution of matter in the visible universe and to determine the number of galaxies and quasars. The Sun is the only star in its cubic parsec,[b] (pc3) but in globular clusters the stellar density could be from 100 to 1000 per cubic parsec. The parsec is apparently used incorrectly as a measurement of time not distance in Han Solo's claim in A New Hope, the first Star Wars film, that he "made the Kessel Run in less than 12 parsecs". This was retconned in Solo: A Star Wars Story. ^ "Cosmic Distance Scales - The Milky Way". Retrieved 24 September 2014. ^ Benedict, G. F.; et al. "Astrometric Stability and Precision of Fine Guidance Sensor #3: The Parallax and Proper Motion of Proxima Centauri" (PDF). Proceedings of the HST Calibration Workshop. pp. 380–384. Retrieved 11 July 2007. ^ a b Dyson, F. W. (March 1913). "Stars, Distribution and drift of, The distribution in space of the stars in Carrington's Circumpolar Catalogue". Monthly Notices of the Royal Astronomical Society. 73 (5): 334–342. Bibcode:1913MNRAS..73..334D. doi:10.1093/mnras/73.5.334. There is a need for a name for this unit of distance. Mr. Charlier has suggested Siriometer ... Professor Turner suggests parsec, which may be taken as an abbreviated form of 'a distance corresponding to a parallax of one second'. ^ High Energy Astrophysics Science Archive Research Center (HEASARC). "Deriving the Parallax Formula". NASA's Imagine the Universe!. Astrophysics Science Division (ASD) at NASA's Goddard Space Flight Center. Retrieved 26 November 2011. ^ Bessel, F. W. (1838). "Bestimmung der Entfernung des 61sten Sterns des Schwans" [Determination of the distance of the 61st star of Cygnus]. Astronomische Nachrichten. 16 (5): 65–96. Bibcode:1838AN.....16...65B. doi:10.1002/asna.18390160502. Archived from the original on 2007-06-24. ^ "Four Resolutions to be Presented for Voting at the IAU XXIX GA". ^ Pogge, Richard. "Astronomy 162". Ohio State University. "The Hipparcos Space Astrometry Mission". Retrieved 28 August 2007. ^ "GAIA". European Space Agency. ^ "Galaxy structures: the large scale structure of the nearby universe". Archived from the original on 5 March 2007. Retrieved 22 May 2007. ^ Mei, S.; Blakeslee, J. P.; Côté, P.; et al. (2007). "The ACS Virgo Cluster Survey. XIII. SBF Distance Catalog and the Three-dimensional Structure of the Virgo Cluster". The Astrophysical Journal. 655 (1): 144–162. arXiv:astro-ph/0702510. Bibcode:2007ApJ...655..144M. doi:10.1086/509598. ^ Lineweaver, Charles H.; Davis, Tamara M. (2005-03-01). "Misconceptions about the Big Bang". Scientific American. 292 (3): 36–45. Bibcode:2005SciAm.292c..36L. doi:10.1038/scientificamerican0305-36. Archived from the original on 2011-08-10. Retrieved 2016-02-04. ^ Kirshner, R. P.; Oemler, A., Jr.; Schechter, P. L.; Shectman, S. A. (1981). "A million cubic megaparsec void in Bootes". The Astrophysical Journal. 248: L57. Bibcode:1981ApJ...248L..57K. doi:10.1086/183623. ISSN 0004-637X. ^ "'Solo' Corrected One of the Most Infamous 'Star Wars' Plot Holes". 2018-05-30.